Here is the final part of the Ultegra Di2 upgrade! 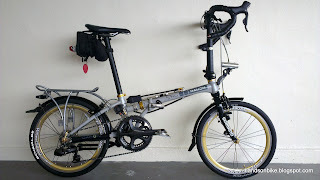 First ever Dahon Boardwalk folding bike with the Shimano Ultegra Di2 system. Read more about the Di2 system in Part 1 and 2 here. 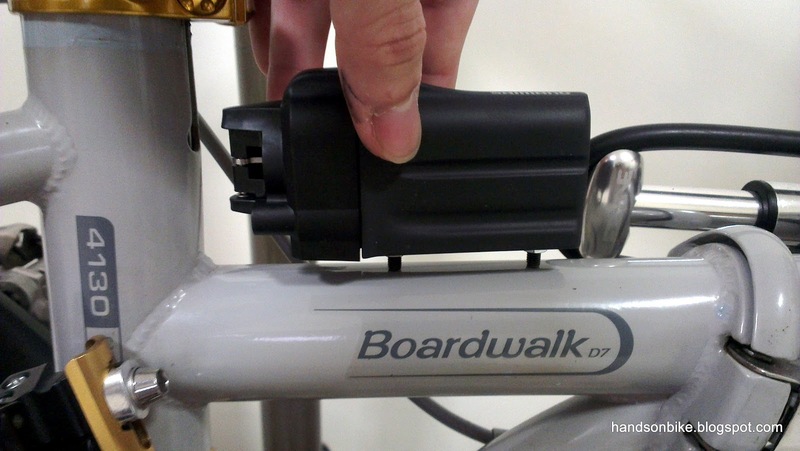 For my Boardwalk, the most tricky part of the installation is the placement of the battery. 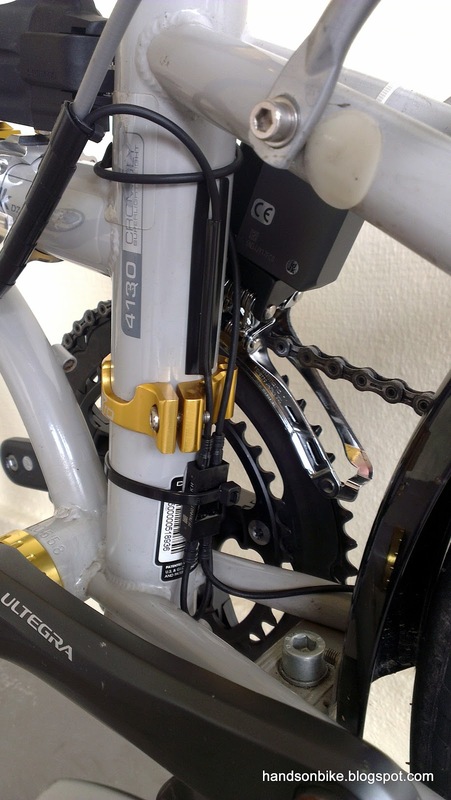 For full sized road bikes, the bottle cage mounts can be used to hold the battery mount. 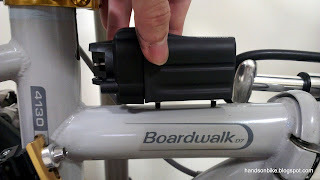 However, since my Boardwalk needs to fold, I cannot use the bottle cage holes to mount the battery. Thus I had to try out other ways to fix the battery to the frame. It is necessary to fix the battery tightly to the frame, so that it does not jiggle around and drop off while riding. Using cable ties is not really possible as the battery mount has nowhere for the cable tie to loop through. 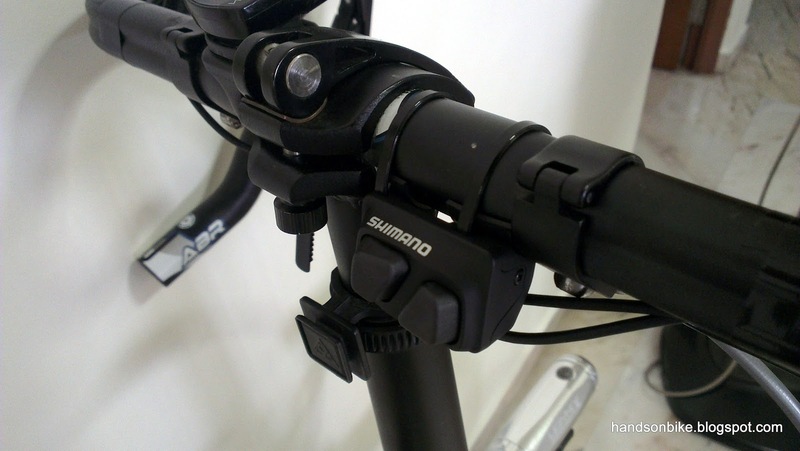 One day, the idea to use the FD adaptor clamp to fix the battery mount suddenly occurred to me. Using 2 adaptor clamps, there would be 2 X M4 holes for me to thread a bolt into. Since the external (short) battery mount uses M4 bolts to fix the battery mount, this solution is perfect! Extra LitePro FD adaptor clamps that I have lying around. Once the "ear" for the FD is removed, I have a M4 threaded hole at the side of the clamp. From what I see, there are only 2 suitable positions to fix the battery mount. One is to fix it on the rear of the seat tube. The other is to mount it on the top of the frame top tube. In the end the decision was to mount it on the top of the frame. 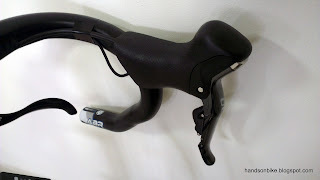 Mount behind seat tube? Difficult as the original FD clamp is in the way. Using the 2 clamps on the top tube. 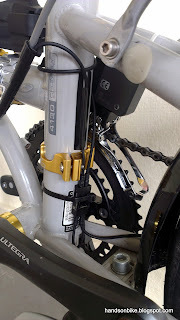 The diameter of the top tube (~38mm) is slightly smaller than the seat tube (40mm external), thus 2 thin rubber strips were needed to make the clamp secure. 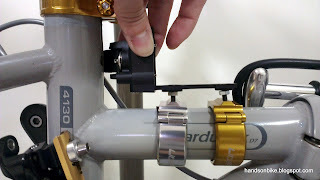 Frames with non-cylindrical top tubes cannot use this mounting method. Estimating the approximate positions for the clamps, using the battery mount. Secure the clamps, and bolt on the battery mount! 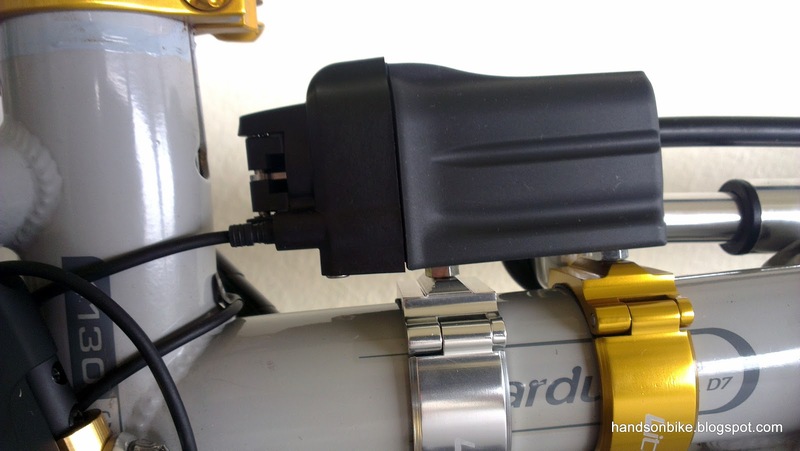 Once the battery mount is settled, the most tricky part of the installation has been settled. Now it is time to fix on the other components. The RD goes on with no issues. 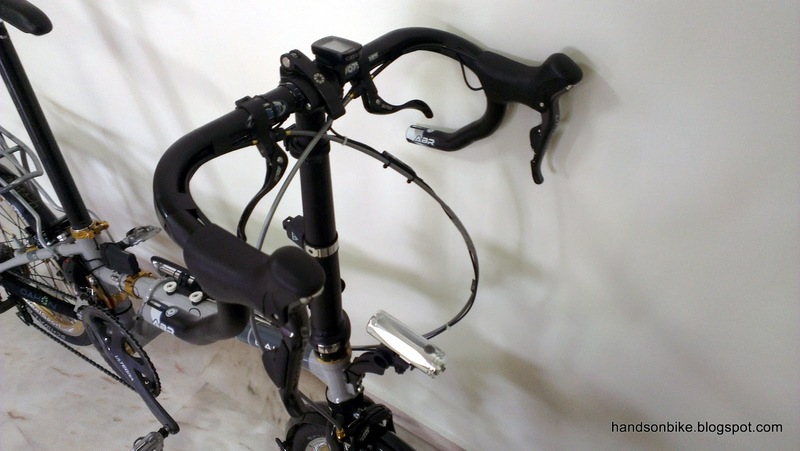 Standard RD hanger mounting. 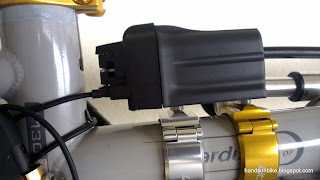 FD is installed onto the previous FD adaptor. 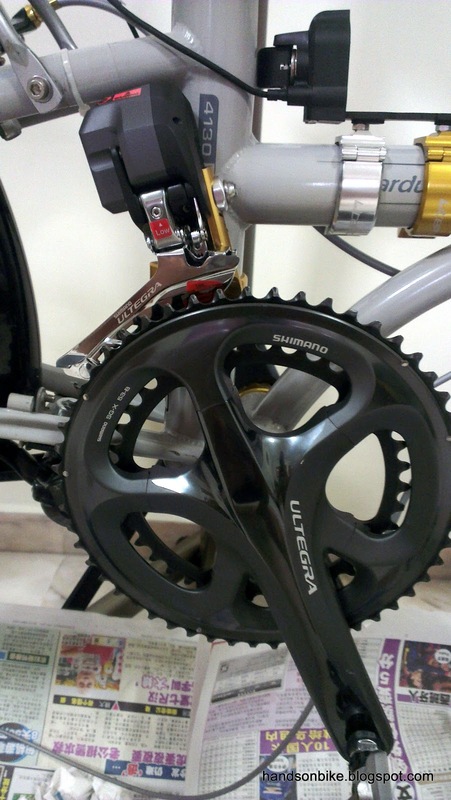 The crankset had already been changed to Ultegra previously, so the colour scheme matches well. 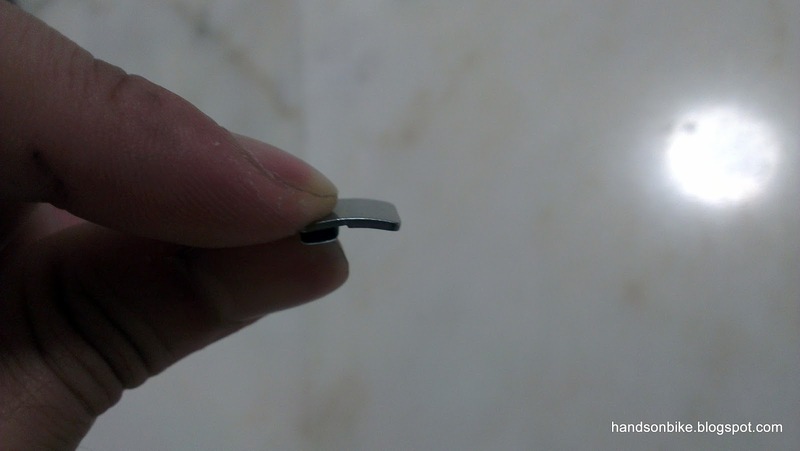 The metal tab that is provided together with the FD. As the FD has an extra screw to help support the FD during shifting, this tab is to be pasted onto the frame to prevent damage to the frame. From the back, you can see the little screw sticking out from the FD, and it rests against the metal tab that is pasted on the frame. The next thing to install would be the shifters. 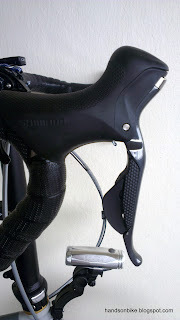 This involves a bit more work as the bar tape has to be removed, along with the existing shifters and the inner cables. 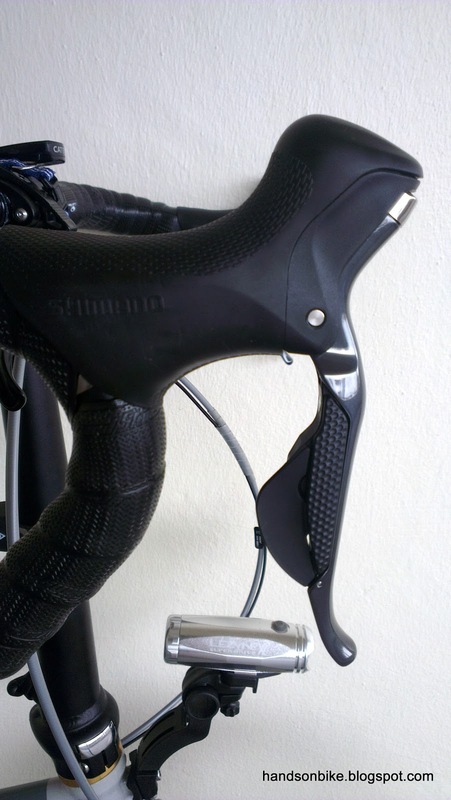 Quick comparison of the Shimano 105 shifters and the Ultegra Di2 shifters. 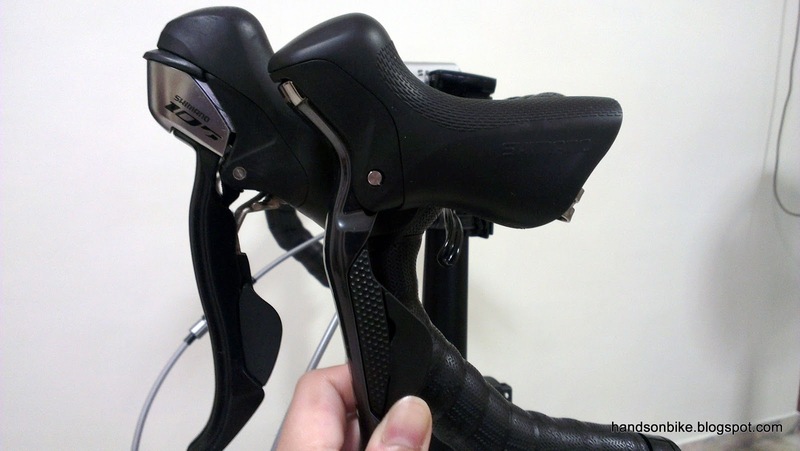 The Ultegra Di2 shifters are smaller in girth and width as there is no internal shifting mechanism. 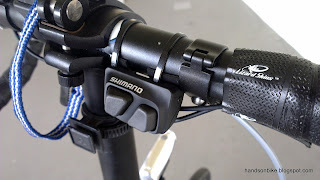 This allows the hand to wrap around more of the shifter hood and give a better grip. Installed the right shifter. The outer casing on top is the brake cable. The 2 wires (one leading to Junction A, the other coming in from the satellite shifter) will be neatly hidden under the bar tape. The left shifter with only one electrical wire, as there is no satellite shifter. 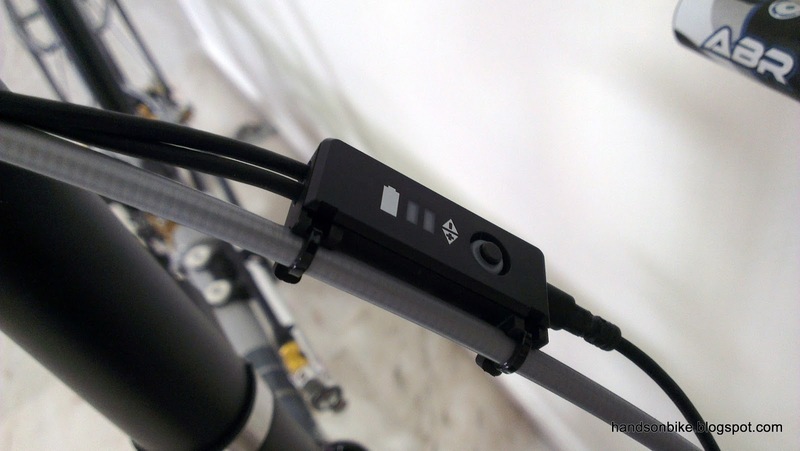 The satellite shifter mounted on the flat part of the handlebar with cable ties. Junction A clipped onto the rear brake housing with cable ties. Quite a clean look as there are only 2 brake housings coming out from the handlebar. 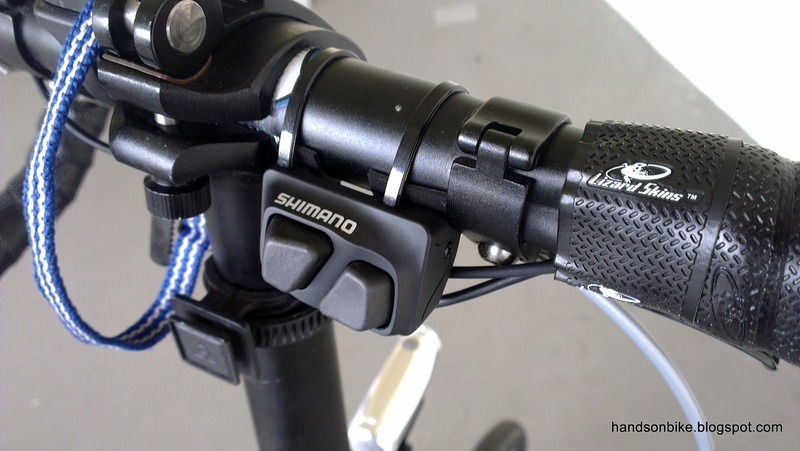 No more shifter cable housings! The last part that needs to be fixed to the bike would be Junction B. This is the part that connects up everything (Junction A, battery, RD, FD). This is usually located around the BB area. I got the internal type Junction B (originally designed to be located inside the frame), as it is small and easy to install anywhere. I found that the best location to put Junction B would be at the back of the seat tube. It would be protected from road spray (the system is waterproof anyway) and is relatively well hidden. I used strong mounting tape to stick Junction B to the seat tube, and then used a cable tie to hold it against the frame. As long as the cable tie doesn't break, Junction B will not slip downwards. Even if the cable tie breaks, the mounting tape will hold it there (it is really sticky!). 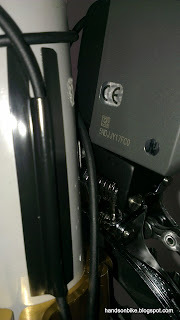 And if the mounting tape peels off from the frame, Junction B will not be going anywhere as it is held in place by the 4 wires connected to it. Using the sticker covers to align and hold the wires against the frame. An overall view of the Junction B setup. The wire length from the FD to Junction B (300mm) is about right, so there is no excessive slack. The wire from the RD to Junction B (500mm) is slightly too long, so I coiled the wire around the chainstay to take up the slack. The wire from the battery mount to Junction B (300mm) is slightly too long, thus I coiled the excess wire around the seat tube before connecting it. The wire length from Junction A to B (1200mm) is just nice. Once everything has been fixed in place, we can start tuning the RD and FD. There must not be slack wires hanging around as it will get snagged on the drivetrain. Tuning this Ultegra Di2 RD is new to me. Unlike conventional mechanical RD, the limit screws are not set first. Rather, the indexing is done first. Start by shifting the RD to the 5th gear. 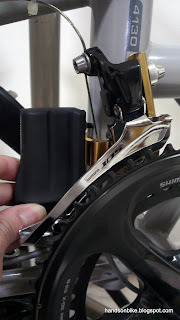 At this point the RD guide pulley may not be aligned to the cassette's 5th gear at all. Press the button on Junction A to enter RD adjustment mode. Then, use the 2 buttons on the shifter to make minute movements to the RD. The aim is to line up the guide pulley with the 5th sprocket on the cassette. Once done, the indexing is set! The RD will shift to all 10 positions accurately. Lastly, tighten the low and high limit screws. These screws do not actually index the RD at the high or low limit, it just acts as a safeguard against overshifting in case the RD acts up. Setting the FD is also quite easy. 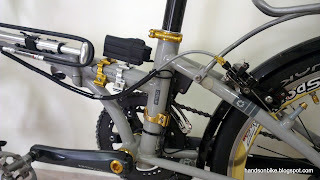 Basically just set the low and high limit screws as per normal FD, the servo motor will know how much to shift the chain guide between the chainrings. Once the RD and FD are both set, you are good to go! More pictures of the complete bike below. Ultegra Di2 RD. Remember to leave some slack for the wire at the RD area as the RD will rotate about the axle in different gears. Can't really see the wires that are running down the back of the seat tube. The wire linking Junction A to B also runs neatly along the rear brake housing. By default, the left button shifts to a higher gear, and the right button shifts to a lower gear. I plan to reprogram it to work the other way round. Some people may want to know about the weight of this Di2 system. 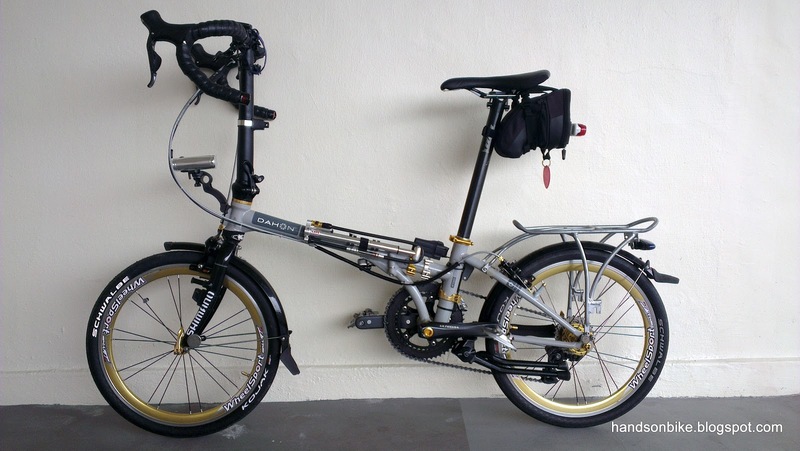 Compared to a conventional shifting system, would it be heavier because of the extra battery? 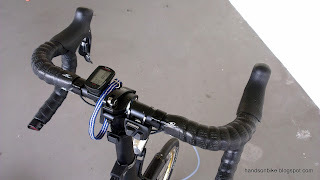 To answer that question, I had weighed all the parts individually (even the wires) in order to do a weight comparison. 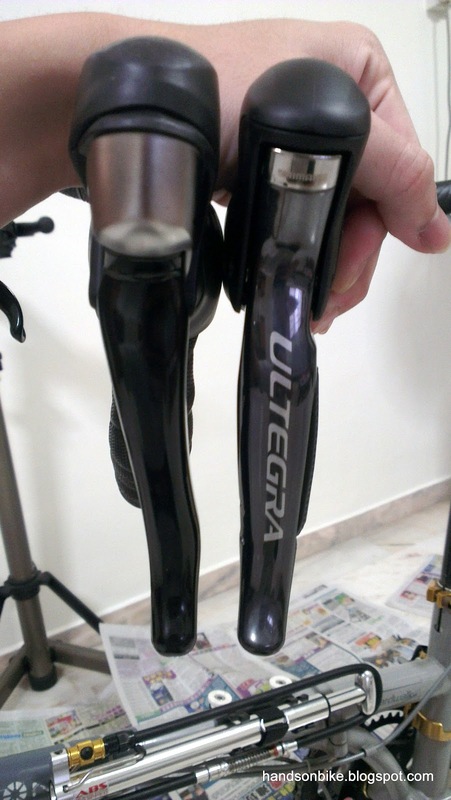 Not a totally fair weight comparison, as the components are from a different series (105 vs Ultegra). But it indicates the weight difference for this upgrade for my bike. 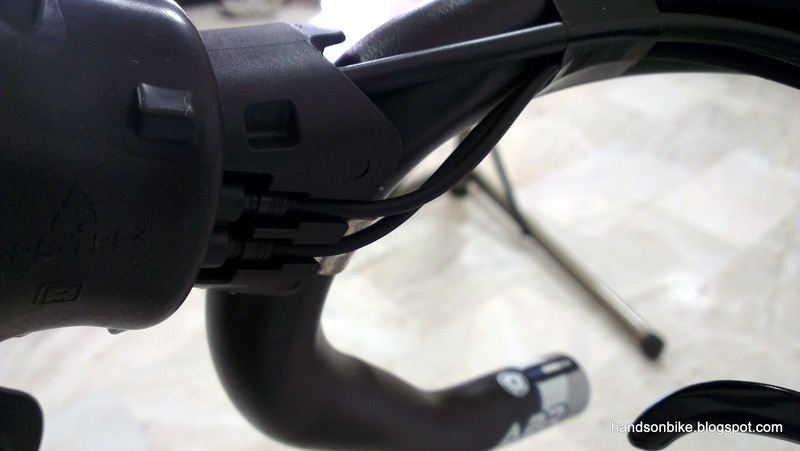 In summary, we can see that although there are extra parts in the Di2 system such as the battery, battery mount, and the junctions, this weight increase is mostly offset by the lighter Di2 shifter and elimination of the shifter cable housings. 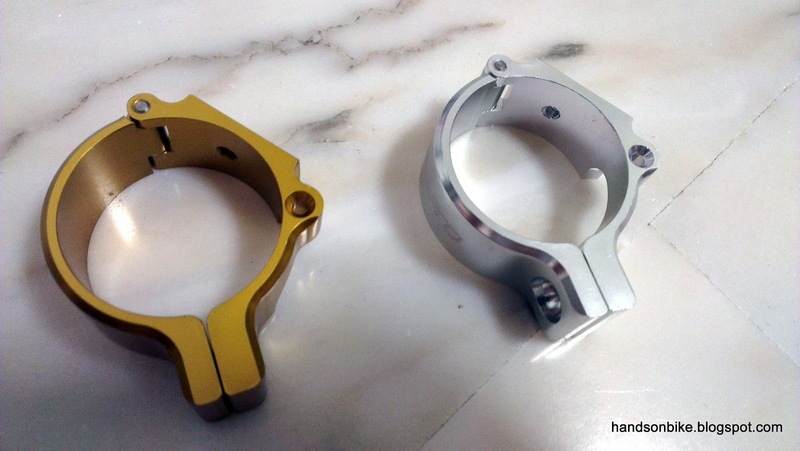 In fact the weight difference is purely caused by the inclusion of the two FD adaptor clamps! Some people are worried that relying on battery power for shifting can give you problems if you run out of juice while out on a ride. However, the reality is that this is unlikely to happen unless you purposely choose to. First, the mileage on a single full battery is probably 1000 miles on average (number from other people's review), which will probably last me a few months. It also depends on how frequent you shift. Next, there are multiple warnings for battery life. Even if you let the battery run all the way down to zero, it is said to be able to shift 150 more times before it completely dies. So, you can only run out of battery power if you deliberately choose to ignore all the battery indicator warnings. Surely it is not difficult to charge it once every few months, when the battery life hits 50%? 1) Effortless, no friction shifting. Pushing a button is so much easier than pushing the levers, especially when shifting gears frequently. 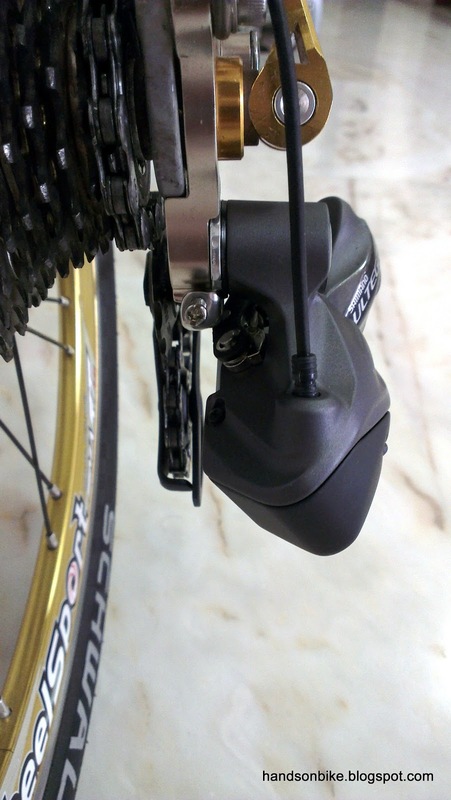 2) Multiple shifting positions possible with the use of satellite shifters. 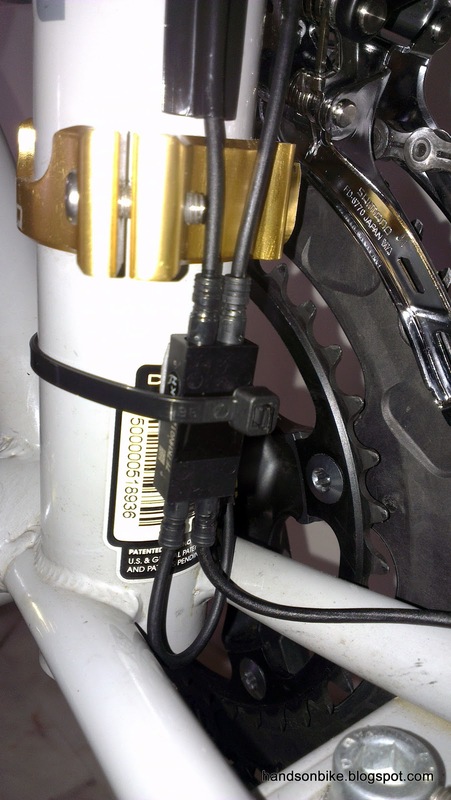 3) No frequent adjustments required for FD and RD, as there is no inner cable stretch. 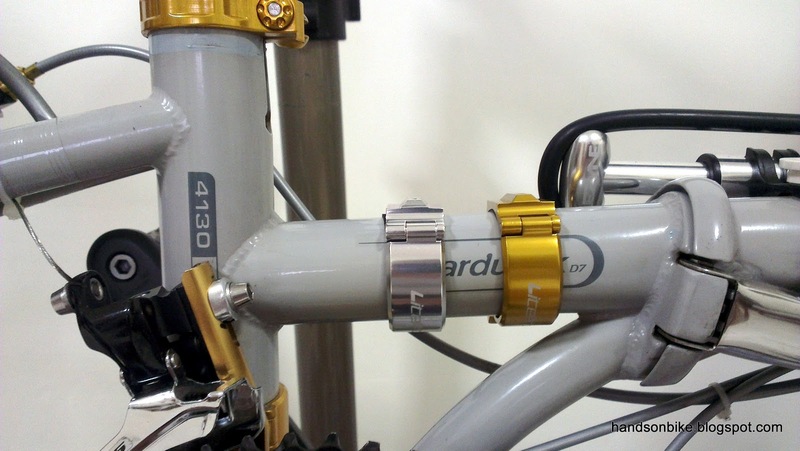 4) Smooth and fast gear engagement for both front and rear shifting. 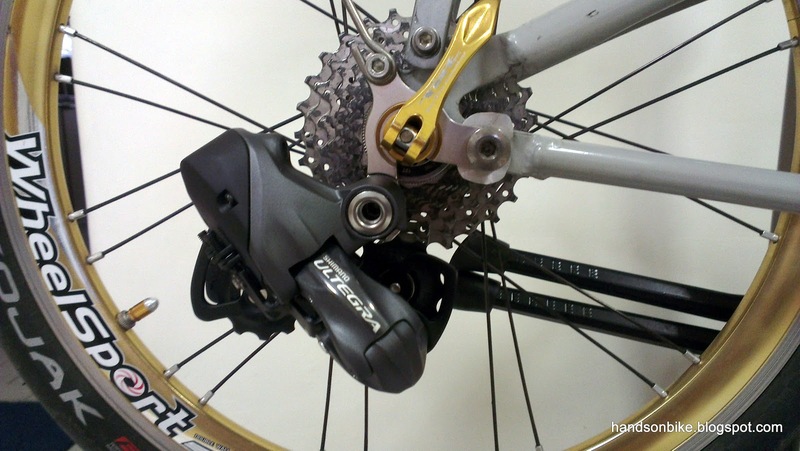 5) Automatic front derailleur trimming, based on position of rear derailleur. 6) Weatherproof, as the system is fully sealed against water, and there are no moving cables that can be jammed up by dirt. 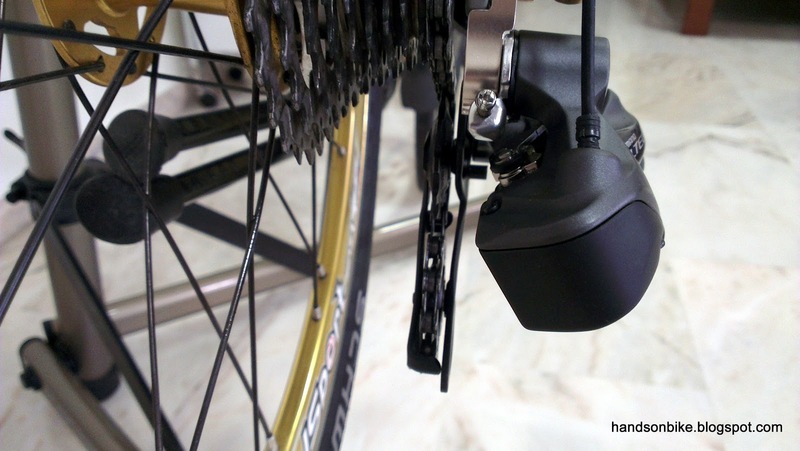 Of course, not everyone may like an electronic shifting system. Some may prefer the clicky feel of a mechanical drivetrain, whereas others may not even need to shift as they ride a fixie or single speed. But for someone who rides a multi-speed bike, having the Ultegra Di2 system is really fun and useful as it makes shifting so effortless that there is no thinking required. Just concentrate on the ride! The next part of the Ultegra Di2 series is now up! Read up on how Ultegra Di2 can be reprogrammed and customized to suit your needs, and what new features it has after a firmware update. It's impressive that you can afford this groupset. And it's nice of you to share your experience trying to fit these with a folder. Components in cycling are evolving to meet the demands of technological advancement. And I respect manufacturers to answer to the demands. However, not trying to burn you, based on your reasoning, you acquired the electronic shifting system because you don't want to deal with sudden changes in terrain from descent to uphill to descent, sounds lazy to me. You rely to much on fanciness when what needs to be worked on is your skills to shift efficiently. Good day. It is a choice. I choose to use electronic technology to assist my shifting, to make it easy and effortless. This leaves me with more energy to focus on other things like admiring the scenery instead of making heavy gear shifts. 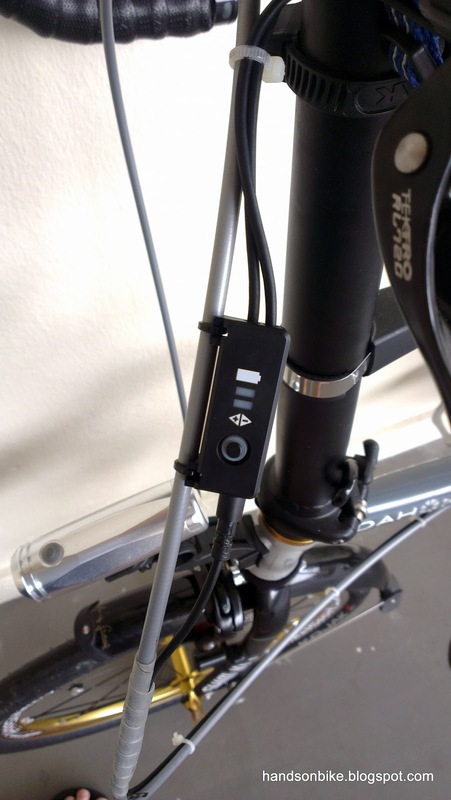 You may say it is lazy, I think of it as making our cycling more effortless. Your flawed analogy is akin to saying people are lazy if they use the elevator, when they can climb the stairs instead. It is a choice, and there is no right or wrong. 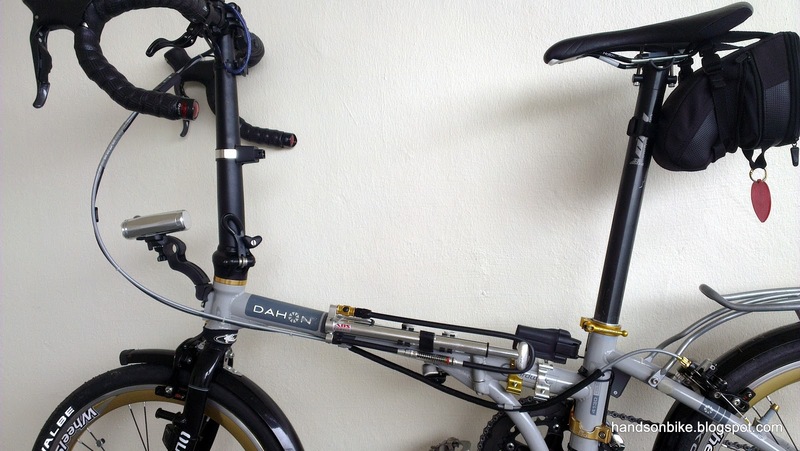 End of the day, both mechanical and electronic groupsets are available. It is up to you to decide and choose the one that you like. I made my choice, and I have not regretted the choice! 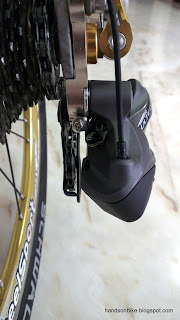 Try electronic shifting and you will be hooked. 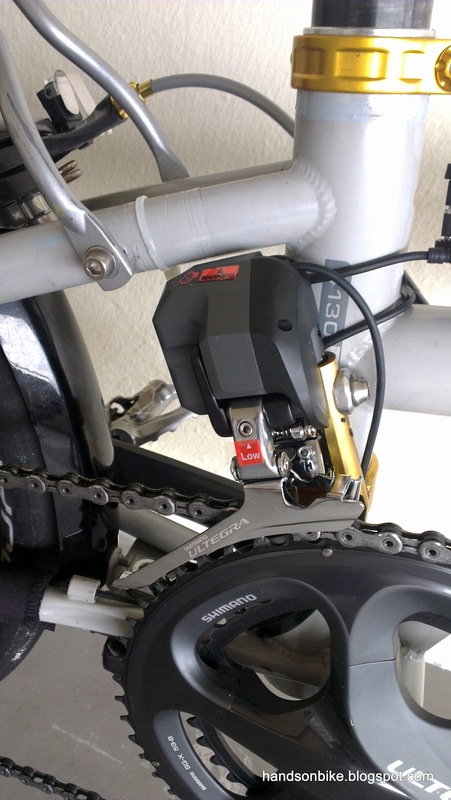 The support for the FD is to stiffen it up, so that under high torque, it can still push the chain to shift. Without the FD support, the FD will still work, but the shifting performance will suffer if shifting under load. The FD will flex and less force is available to shift the chain. Thanks Steve, maybe I can set up a L bracket behind the deraileur for it to push against.. I will probably end up having to do just that. The Vitesse p18 was a later model and had a braze on hanger. 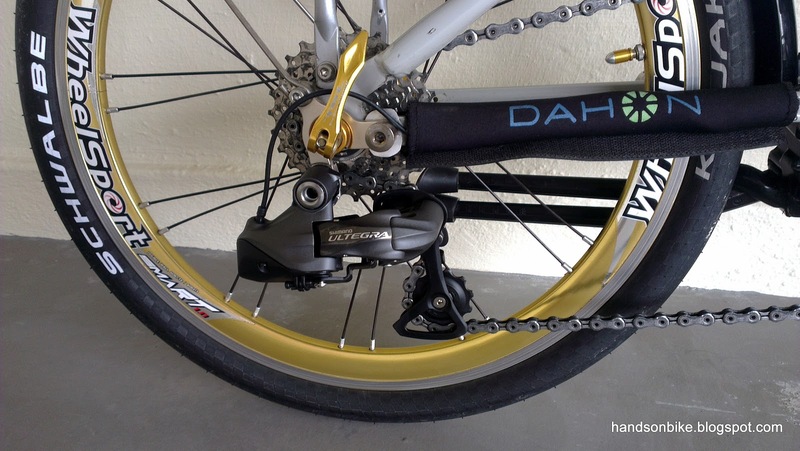 Dahon apparently set it up to be used with their square taper bottom bracket that is longer and placed the chainrings further out. I am trying to install a DA7900 crankset and the front derailleur mounts too far out and not allowing the front derailleur to line up. I am going to have to cut off the braze on....@*!#*%, I don't think I could do it neatly. Any ideas? Are you able to adjust the low limit screw of the FD such that it can be further inwards? 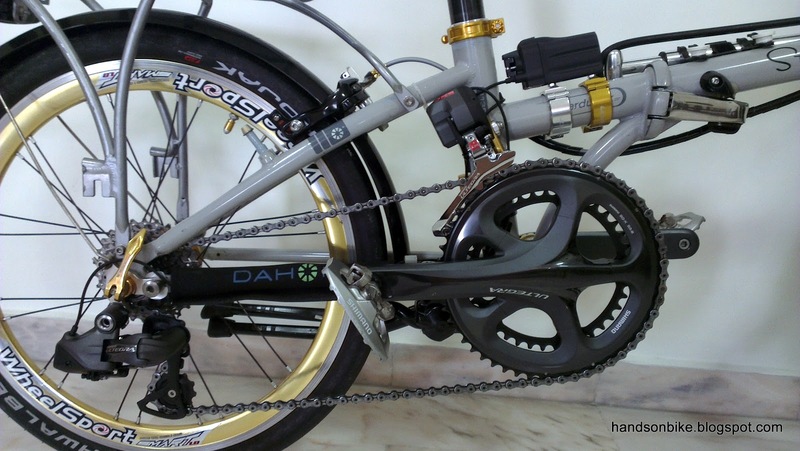 If not, the only option is to push the crankset outwards. You can't really push out the crankset out by much as the spindle length is limited. Push it out the right side too much and there is too little thread on the left side for tightening. I estimate that the most you can offset the right side is 1mm. You can try something like this to extend the spindle on the left side. I have not tried it personally so I don't know if it works properly and is safe or not, but you can give it a try. Gee you know your stuff !, It is almost like you are here helping me ! Thank you ! You know exactly the problem I am having. I've pushed the crank out by 2 mm and I need more. I figured I could go 2 mm, because the other bb for Italian threads is 70mm and mine is 68mm (english). I have yet to receive a Shimano BB in hopes that the cups are a little thicker than the FSA GXP BB I am testing with. That shaft extender is just what I need. They have everything on TaoBao. But I think I need the M20 model. Would I be able to please get you to "surf" taobao for me and let me know if you can find a M20 model? I have a contact to hopefully buy it, but I need the exact item on taobao. 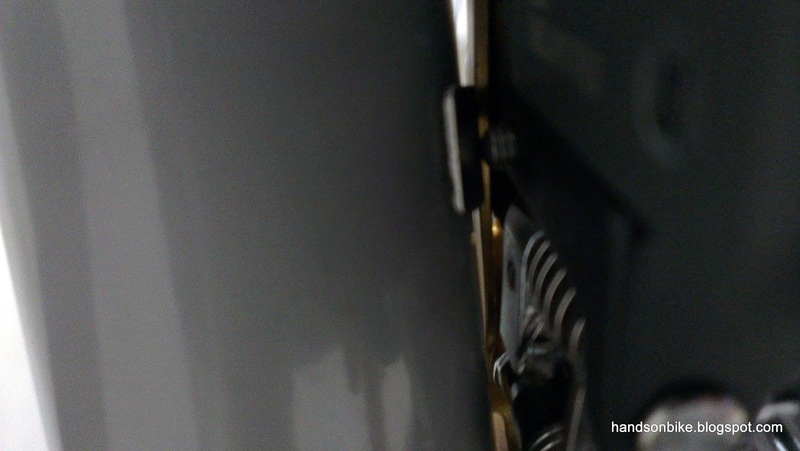 OR.......just cut the braze on hanger off, I wonder if there will be a hole where it was welded? Do you have an email I can send you some pictures, or (email me at dlimjr on gmail) and maybe you can see what exact problem I am having? There is also the braze on hanger, that is very thick and wide that is not allowing the derailleur to sit at the correct angle, I may need to get a angled spacer shim, which I found a SRAM angled front derailleur shim, but didn't buy yet thinking I may need to "operate"...hee hee...Nothings ever easy, when you are modifying. Did I tell you I am installing a control tech 451 carbon caliper only fork? 451 litepro wheels,Ultremo ZX tires, lightweight Schwalbe tubes, a rear caliper adapter mount, rear DA 7900 caliper brakes, Coolstop pads, Hylix carbon seat post, lots of titanium bolts, Jetstream handle post w/litepro flatbar handlebar with Paul cross brake levers, Fizik tt Areas saddle, and all Dura Ace 7900 drive train, and Di2? Now there is another issue coming up later with the shift buttons. I plan to use "cateye" switch buttons and rewire the shifter buttons, being the older 7970, I "read" you could do that...well see... Anyways, M20 adapter? Thank you soooooo much for helping me and listening to me "boast" (embarassed)...but I thought with your cool stable of folders, you might enjoy hearing that there is a "nut" in San Francisco playing around with dahon folders.. It will be challenging installing the 7970 Di2 as the wire lengths are fixed, and the frame geometry of the folding bike is quite different from a road bike frame. Another thing you can try is to use a triple crankset as the spindle is longer, you can then offset the crankset to the right and still have sufficient length on the length for fixing the left crank. There is no difference in chainline whether you have the 70mm bb cup or the 68mm bb cup, as the 70mm bb cup is thinner by 1mm on each side to make up the difference. What you need is a longer spindle so that you can offset the crankset to the right. A road triple crankset has a spindle that is 2.5mm longer, so you can offset that amount + 1mm to the right, which hopefully is enough. Just remove the smallest chainring and use the larger 2 for the road double system. Thank you tylsteve. I may just end up doing "surgery". Since I already have the crank, it may be just easier to cut and cover up? My main thing was that I wanted to confirm that the bike may have been set up for a wider axle, and there were no other solutions to my problem. I found some real carbon fiber sheet samples that may cover the wound nicely. I wouldn't recommended cutting the FD hanger off, as using the LitePro FD adaptor also comes with its own problems. Thanks tylsteve !, btw, what problems dies the LitePro FD adaptor have? The Fd adaptor itself kind of blocks the Fd from going too inwards, so there will be chain rub when in the front top and rear low gear combination.